In this case, my hour log is quite handy. I have a good feeling of the amount of time it will take to complete this piece including time to chat with the onlookers. 3.) glazing a brilliant pink to maroon on the throat feathers of the male calliope. The glazing will take numerous coats and usually dries in about 15 minutes. 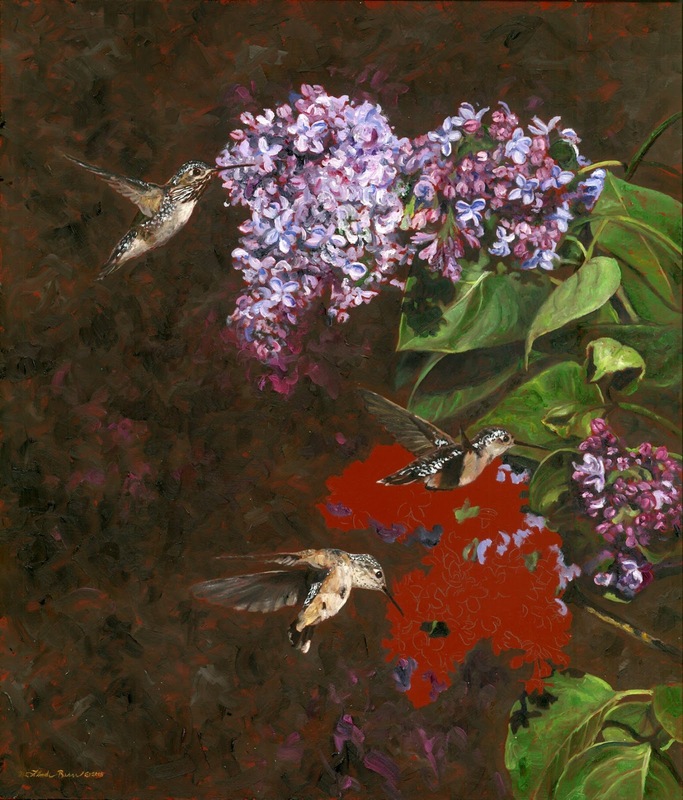 I'll start with a coat and while it dries work on the lilac. Then another coat and back to the lilac. The last 15 minutes or so will be overall touches to the piece. With screwdriver in hand, the painting will go in my frame and I will be ready for Lilac City to be auctioned. On May 30th, I will be participating in a Quick Finish at the Spokane Valley Arts Council Auction in Spokane Valley, WA. Last year there were more than a dozen of us painting, carving and sculpting. The big question in preparing for one of these is how much to do ahead of time. There will be artists who come with a blank canvas and others who will have quite a bit done. Since 50% of the proceeds go to the Spokane Valley Arts Council, I am opting to have a painting well along. The complementary frame is already ordered. Spokane is the Lilac City, so....... lilacs. 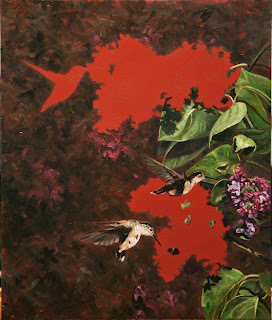 These are hummingbirds which we have at our house daily this time of year. I took the reference shots last year. 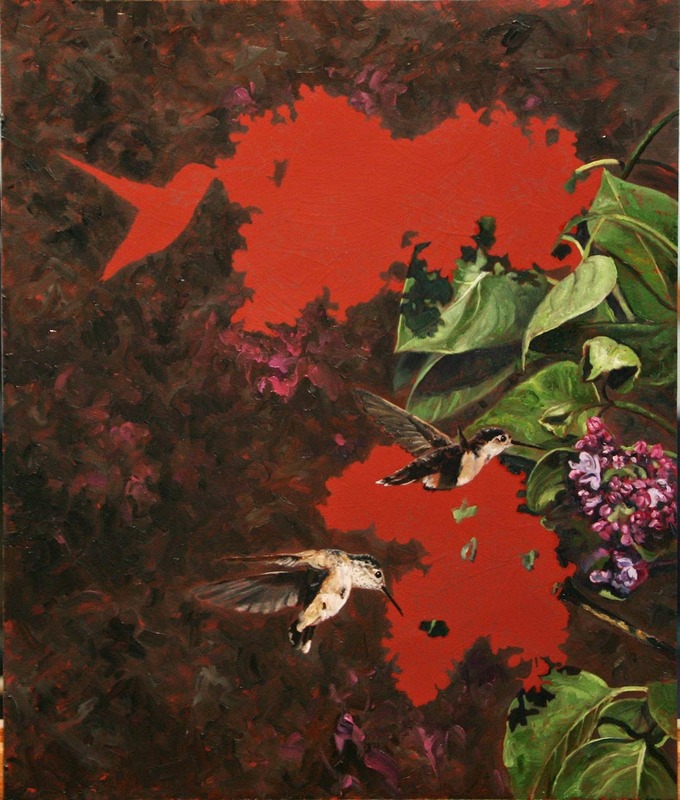 At this stage, the two female hummingbirds may look a bit dull. I have painted a very dark layer where the metallic green feathers will be. Once the dark layer dries, I'll be delicately laying in white with a fine brush which should dry by the 30th. When I am at the quick finish, I'll be glazing over the white with a bright green mixed with Liquin. This is one spot where Liquin is the ideal substance. The thinness of the color and the transparency over the white will help the color bounce off and create that glistening metallic feel. 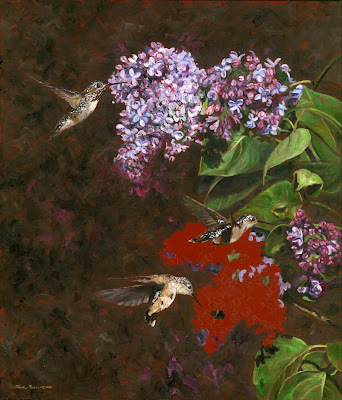 The male calliope in the upper left will get a splash of brilliant pink on the feathers under his throat. 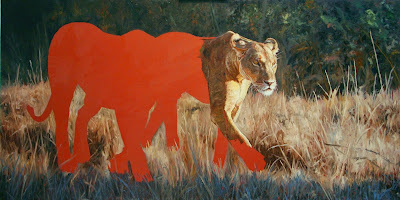 Now that the first lioness is mostly done, it might seem that the second will be a piece of cake. All the colors are mixed, the lights and darks are established...should be simple. 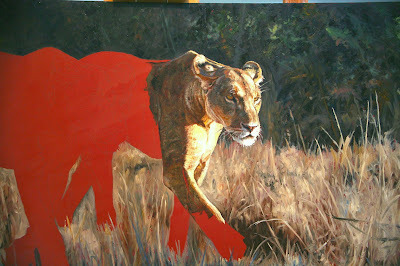 With the second lioness closer and in a different plane of field, all the colors will need to be slightly adjusted. I'll be making the cools a little cooler, the warms a little warmer. Darks will be magnified and there will need to be more detail inferred in the fur. Most artists dread the "ugly stage" of their paintings. The place where it doesn't really look like anything yet and they need to drag the piece into their vision. For me, this is the stage I most dread. 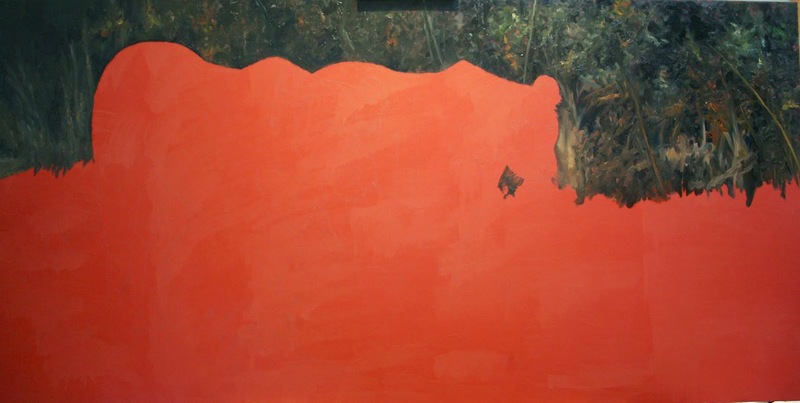 The painting does look like something and I need to paint the rest of it with the same quality and dynamic range. While I'd like to get right on the next cat, I have a show on May 30th in which I will be doing a quick-finish demonstration. 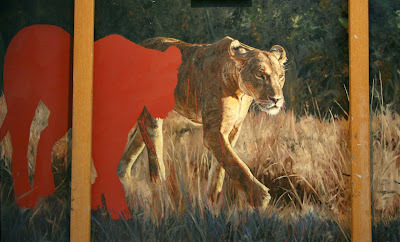 In a quick-finish, the artist can have as much of the painting done as he wants. He just has to finish it in an hour and a half. For these types of events, I like to have most of the painting done with the edges dry. I'll be working on the piece this week and then I can go back to my kitties. One of the things I like best about painting with oil paint is the fact that it does not dry quickly. This works particularly well for portraying fur. Put on some color, move it around, add more color, grab an angle brush for tighter strokes, slide it around some more ... in essence, play. Rembrandt oil paints are my favorite because of their buttery nature. Simply highly concentrated pigment in linseed or safflower oil, they contain no fillers, no waxes, no fast drying agents. When we artists refer to the buttery nature of our paints we mean they are not stiff and hard to move. Rembrandt oil paints are buttery enough that I use no medium. Just mix directly from the tube. Mediums like Liquin can give paint a smoother feel so it glides more easily. Another advantage is that the paint will dry more quickly. A disadvantage (and a major one I believe) is that you are diluting the color just as adding water to water-based paint dilutes the color. This first cat head will be the slowest section of the painting. I'm constantly adjusting my colors. Cooler, warmer, lighter, darker. I may paint in a section and then see it needs more cad yellow with a hint of yellow ochre. I'll be keying the rest of the two cats from this section. Eyes always take me a long time as I work on the right look. Pupils too big and she will look scared. Iris too dark and her eyes will sink into the background. Just the slightest bit off and the eyes can look cross-eyed. The painting wouldn't look so weird if I had posted after the ears were painted but I wanted you see this stage. Also since the last post, I made the foreground shadow more blue. The cooler color adds more temperature contrast to the painting. One brush. I have been thinking about how I wanted to paint this first base of grass. For a piece this large, I could just put in a large blocks of color, wait for them to dry and then put additional grass layers on top. I opted instead to mix a number of colors and using a 3/8" deep angle flat brush began painting. And painting. There is a lot of real estate here. It might have taken more time than using a large brush, but I think the result will be a seemingly more detailed grass section. 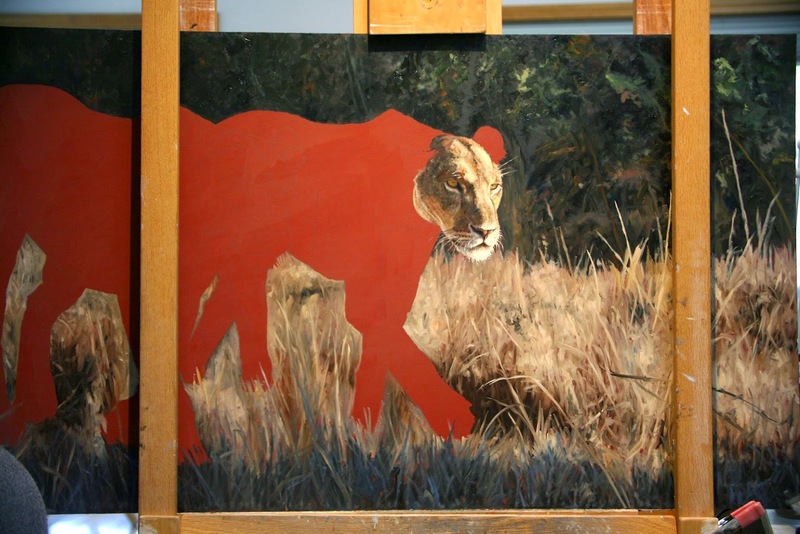 I am not finished with the grass and will further refine it once the animals are painted. Another big piece is on my easel. It has been a while since my last post and a lot of the time was spent working out the composition for this planned 30" X 60" piece. There are a myriad number of decisions to make before a single brushstroke of paint hits my gessoed board. 1.) What do I paint? Why? 2.) Is this something fresh and new? 3.) Am I excited about the idea? 5.) Do I use a white or Venetian Red gesso? After that it is hand applying gesso to the board. Then, drawing. Logistics come into play with a board this large. I have a 28" X 50" one-inch thick drawing board with a ledge at the bottom. The backside I prop up with some of my thick bird reference books to give a slope. A pencil and an eraser and I am off. What I have painted so far may just look like gobbly-gook. I may make adjustments to the background later, but for now it has the movement and colors I want to create a sense of depth.